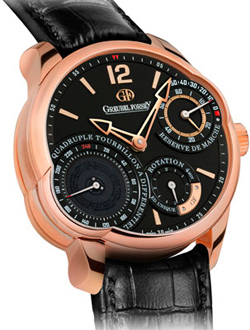 The famous watch brand Greubel Forsey presents the new limited edition watch Quadruple Tourbillon Secret of red gold 5N. Reserved, but at the same time, the original design innovations embodied in the dial, under which “hides” magical work 4 tourbillons. Black dial, made of gold, has the Arabic numeral “12”, plated with gold hour-markers, and skeletonirovannymi arrows of gold 750. Highly complex system Tourbillon hide under a dial two different sizes at the bottom of the main dial. Under the dial gauge is a difficult time with a pair of double tourbillons, which are connected by a spherical differential that provides the whole hour of micromechanics. The work of a unique mechanism can be seen through the transparent case back, but you can see it in fragments through the window and sub-dial, located on the main dial. Big dial is set to “7:00” and displays the rotation of the outer tourbillon carriage twin 240-second scale, and a small dial located at the labels 5, displays the rotation of the 4-minute scale. Spherical differential connects the pair of tourbillons, ensuring the work of the wheel axle. Small second, located at the label 2, is an indicator of both regulatory calibers. Masters of Greubel Forsey, Robert Grebel (Robert Greubel) and Stephen Forsey (Stephen Forsey) to create a new mechanism for the model Quadruple Tourbillon Secret RG set out to in the first place to meet the expectations of potential owners. A personal approach is guaranteed by a limited number of models produced eight instances of 5N red gold and platinum. Caliber, consisting of 519 components, 216 of which forms a four Tourbillon carriage is equipped with a frequency of 21,600 vibrations per hour, 50-hour power reserve, provided by the work of two drums. Platinum and bridges are made of nickel silver with pearl-grained, have nickel-palladium-plated and polished beveled edges. Mechanism is inserted into the body of red gold 5N diameter 43.50 mm and a thickness of 16.11 mm. The front side of the case closes convex sapphire glass, asymmetrical goes beyond the main dial. Another sapphire crystal is inserted in the side window on the left side of the body. Complements novelty hand-stitched black leather strap with a folding clasp in red gold 5N. The exact mechanism of the course, especially in a stable position, providing a link with a spherical differential of each of the four tourbillons. The principle of operation of the new watch caliber Quadruple Tourbillon based on paired together with a spherical differential of four independent block. Spherical differential mechanism provides not only the work of four tourbillons, but also stabilizes the functioning of all the regulatory mechanisms. Two double tourbillon inclined at an angle at 30 °, are connected by a spherical differential on which the work of the wheel axle. Shaping and finishing hours Quadruple Tourbillon Secret performed by hand in the tradition of the brand Greubel Forsey.